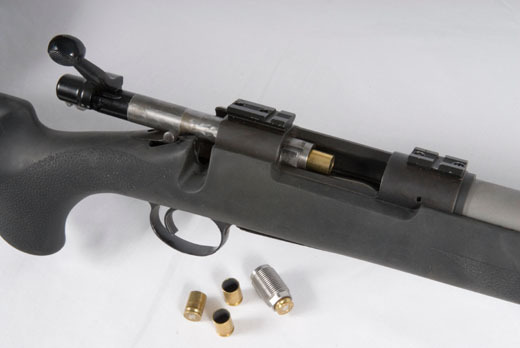 Massive locking lugs on the front of the bolt makes the 700 Remington rifle action the perfect choice for a muzzleloader. Large rifle primers are used to ignite magnum powder charges. Shortened 6mm Remington cases are used to hold the primers. These cases withstand pressures in excess of 70,000 psi when used in a cartridge rifle and are more than capable of sealing the back of any load from a muzzleloader. Select the stock option that best suits your purposes and your budget. Stock on the right is the factory 700 BDL. We have opened the barrel channel to free float the barrel and glass bedded the action. The two stocks in the center are Hogue pillar bedded replacement stocks. The Left one is for a 77 MK II Ruger action and the one on the right is for a 700 Remington BDL. The stock on the left is the king of stability. It is a Hogue with an aluminum block molded right into the stock. The aluminum block is a mirror image of the receiver and offers the ultimate in stability. All are available for Ruger and Remington actions. Simply remove the bolt, insert the 9/16" 6 point supplied socket to remove the breech plug. Removable vent liners are supplied with .033" hole. We never started out with the intention of building muzzleloaders. The frustration of every factory gun needing tweaking to get the performance we demand caused us to put our ideas into iron. 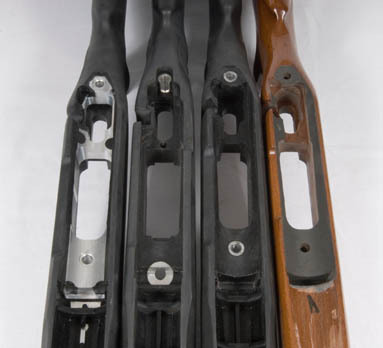 Bolt action muzzleloaders with no locking lugs on the bolt; bolt action muzzleloaders with one screw holding the receiver to the stock; bolt action muzzleloaders where you must remove the very bolts that hold the gun together to remove the breech plug; bolt action muzzleloaders where the primer is held by a disposable chunk of plastic. Clearly, the designers of these guns don't actually shoot them. 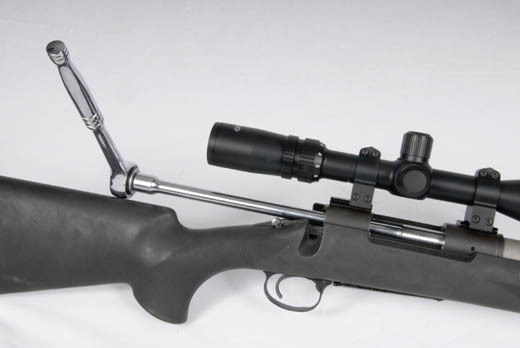 The Rigid strap wrench in the top of the photo is all that is required to remove the barrel. You can have your original factory cartridge barrel head spaced so it too can be removed with the strap wrench. The 700 Remington has five different barrels. 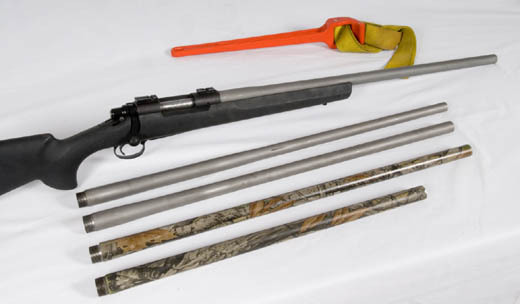 .22-250 bench rest quality, a pair of .45 muzzleloader barrels and a pair of .50 muzzleloader barrels. By setting up a separate scope for each barrel, entire switches can be done in several minutes with little shift in point of impact with either barrel. We have done a handful of these conversions each year for the past several years. It was an interesting sideline. As we got more of these guns in the field, we got more requests to build them. We were buying such small quantities of barrels, we could not control the contours nor could we control the price. A decision had to be made. Sparing you of all the details, we decided to add our muzzleloader conversion to our regular gunsmithing menu. You provide the action; we provide whatever else you require. The following are a list of common questions and the answers. Which models of actions do we convert? We work on 700 and Ruger 77 actions. Short actions with a standard bolt face work best but we will also do long actions. Bolt face must be the .308, .243 size. We have contoured .45 and .50 caliber barrels ready to go. Depending on the work required, turn around time will run from 10 to 30 days. Our barrels are made of the same alloy used by many of the custom cartridge barrel makers. The material has a burst rate of about 80,000psi. All barrels are contoured to fit Hogue Varmint profile stocks. What are my stock options? You can have us do nothing to your stock. You can buy a Hogue pillar bedded stock. You can buy a Hogue aluminum bedding block stock.